With all the magnificent kiteboarding spots in the world, why choose Cape Town? It is one of the top spots in the world, but what makes it so great and what does it have to offer you? We have the Red Bull Kind of the Air which usually takes place in January. Throughout the summer we have the South African Kite Tour, where you can see the best riders in the country, and abroad, strutting their stuff on the Cape Town waters. We also have the annual Langebaan Downwind Dash, the biggest Kitesurfing and Windsurfing event in Africa, also in January. But if you are not a pro rider, or if you are not even a rider who competes at all, at any level, what does Cape Town have to offer you? Does Cape Town truly have something to offer every single rider, from the lazy lawn mower to the wild wakestylers? Sure, the big waves and signature South East winds can sometimes get a bit much for beginners, but the great thing about Cape Town is the many different spots. If the wind is too strong for you, you can go to a spot where the wind is lighter; or stronger, if that’s what you want! If you want waves, we have waves. We have the kind of waves you thought were only formed in your wildest dreams. Or if you want to glide along untouched butter-flat water, we have that too! The most popular spot is Kitebeach in Tableview. Here you will find hundreds of kiteboarders adorning the sky with multicolours, but if you are like me and you don’t like the crowds, the stretch of beach is so long that you can easily find a quiet spot. Or you can do a long downwinder from one beach to the other and then catch a lift back with one of the many other down-winding locals because the long stretch of beach has a road running right alongside it! If you need to rent, buy or repair any gear, there are many kite shops nestled in between the restaurants, bars and houses on the beachfront and surrounds. The great thing about Cape Town is that your session does not end when you walk off the beach. Do not be surprised if one of the locals starts talking to you and invites you to join them for a beer at the popular Hawaiian themed bar called “Pakalolo.” There you will chat to fellow kiteboarding fanatics whilst watching the sunset and the last few riders braving the 40+knot winds. You may then even be invited to join them for a good old South African “braai” (a barbeque like no other). Or pop in at Carluccis for a coffee and don’t act too surprised when you see the best riders in the world hanging out there before and after their sessions! If you are dragging family or friends with you who would prefer to stay out of the wind, they can go to one of the beachfront restaurants while watching you kite. Or they could visit one of the many world-class wine farms, go shopping, go for a hike or cable car ride up the famous Table Mountain, go stand up paddling or surfing or go on a wildlife safari. You will be way too busy kiteboarding so don’t count on joining them! As if you need any more convincing, South Africa is a 3rd world country which means it has 3rd world prices and your holiday will be cheap. But besides that, Cape Town is definitely 1st world when it comes to things like renting a car and accommodation, general safety, health and wellness facilities, shopping and entertainment. On top of that, our summers are hot, sunny and rain-free. We never see or experience sharks while in the water, only friendly seals and curious dolphins. We also have no natural disasters. Cape Town is home to some of the finest wave riders, foil-boarders, budding beginners, world-class freestylers who are proudly competing on the world tour and of course, many, many WOO obsessed airstylers. 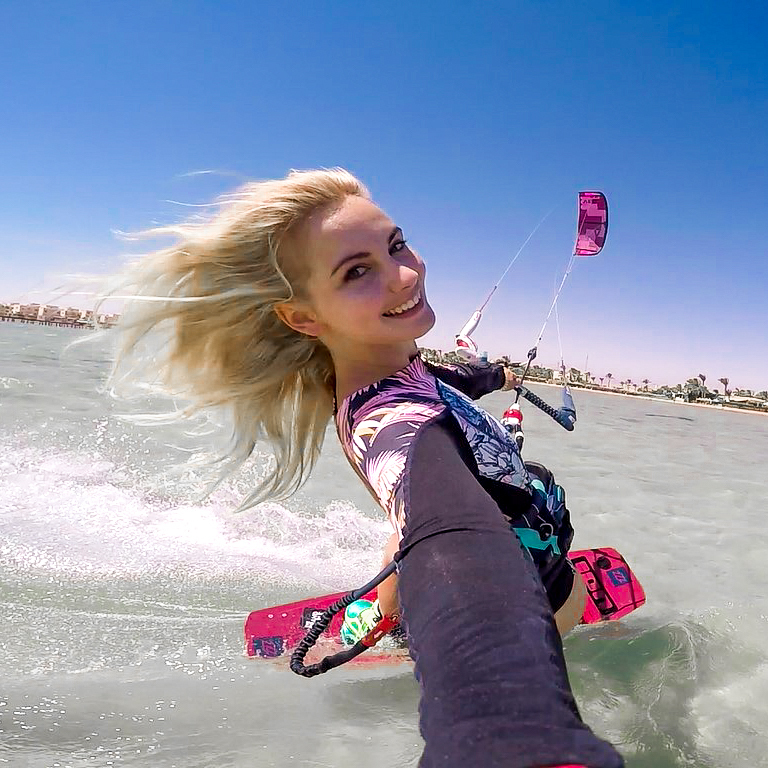 The best time for kiteboarding (and by the “best time” I mean the wind blows every single day) is during our summer, between November and March. The best place to stay would be Tableview beachfront, where, as the name states, you will have a spectacular view of Table Mountain across the bay. That is, however, if you can see past all the kiters in the water.